Recently, the Baker EFP crew travelled from its base of Charlotte, NC, to Lake Lure, NC to offer Good Morning America viewers a glimpse of one of North Carolina’s secret treasures. 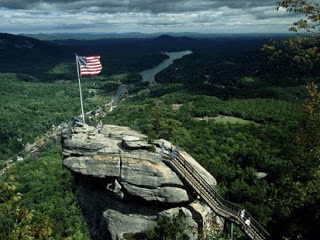 The stunning vistas and beautiful waterways of Chimney Rock and Lake Lure have been host to many a tourist, hiker, and fisherman, as well as serving as shooting locations for films such as “Last of the Mohicans” and “Dirty Dancing“. It wasn’t easy scaling the heights with the High Definition Varicam and all of it’s accoutrements but the chance to explore this beautiful region and bring it into the homes of viewers everywhere is “precisely why I never wanted a Real job” said Go To Team camera man Dave Baker. To see the video, Visit Good Morning America’s Weekend Window.